Supra ITS is a full-service technology partner, providing customers across a variety of industries with seamless, extensive infrastructure and managed IT services that deliver value, business efficiencies and boost performance. From hardware, software and Cloud infrastructure to strategic consulting and a complete suite of Managed IT services, Supra ITS offers clients the full-service package, and has been Canadian owned and operated since opening its doors in 1999. We can point to customers past and present, big and small, across dozens of industry sectors. But that’s not the whole story. We treat each new customer as a fresh challenge to create the perfect technology solution. 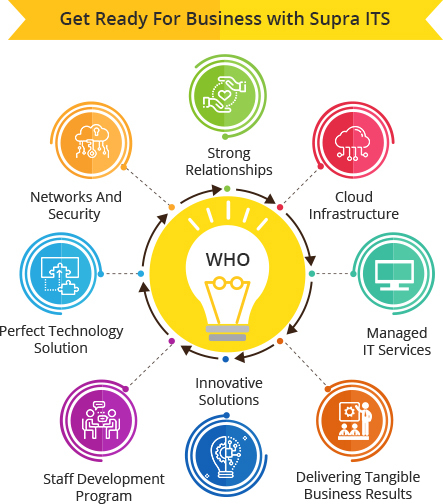 With a network of integrated companies – each an expert in its field – Supra ITS can build, manage and maintain network and IT infrastructure over key business areas, from Cloud services to strategic consulting, networks and security to service desk and support. Just as we encourage our clients to focus on what matters most to their core business, there are a few guiding principles and qualities we hold above others. They help our business stay healthy and maintain the right course. We call these our pillars. Industry leadership is a by-product of driving and delivering tangible business results for clients. Using the best technologies as standard provides a foundation for reliable, innovative solutions that clients can grow with. Great teams are made of great people. We created the Staff Development Program to ensure quality, motivation and engagement are always present at Supra ITS. Self-assessment drives improved performance and creates a platform for innovation. More than we’d like to admit, technology is the backbone of business, enabling cost and process efficiencies that can make or break the bottom line. The greatest benefits to our clients are found in how we apply and leverage our group strength, from the collective expertise and resources to the 24/7 service available from our offices and worldwide network. As much as a good hire or major strategic directive can change the course of your business, technology can hold you back or drive you forward. That understanding shapes how we serve customers and develop great business solutions. From Canadian SMBs to global multinational organizations, our company is specifically and purposefully positioned to be able to rapidly or strategically deploy teams or personnel with the skills and tools to meet every IT challenge. Privacy | Sitemap | Copyright © 2018 Supra ITS. All rights reserved.